"My grandad died when I was two years old, but I have always been fascinated with his life and his part in World War One. He was in the West Yorkshire regiment and then the machine gun corps. He was awarded the military medal for bravery, which was published in the London Gazette on 2nd April 1918. "Our family were told that he left his trench under enemy fire, and crossed into no mans land to rescue an injured soldier. We know there was a citation presented to him on his return but nobody knows what happened to it. My further research showed he fought in the Somme, Arras and Ypres - battles which saw some of the worst fighting. "He was injured in a mustard gas attack and sent home to recuperate, then returned to the front, before being honourably discharged in 1918. He kept a tiny piece of wood in the dresser at home which came from Mametz wood in the Somme. On a recent holiday to northern France I visited Mametz, so I could stand in the place where he had fought. I'm very proud to be his granddaughter." "My great grandfather served with the 12th,13th and 14th battalions of the Northumberland fusiliers and also with the machine gun corps. Whilst doing my family tree I was lucky enough to be given some of his belongings which included his medals and some silk postcards sent from France to his two sons. "However, my most precious possession is a letter dated 12th December,1916 to his son Arthur - my grandad, who was seven at the time it was written. "I have always wondered where my great grandad was,when it was written, and the fusiliers museum in Alnwick, confirmed from their war diaries that the battalion was in Lens, near Arras at that time. "The letter says "My dear loving son Arthur. Just a few lines in answer to your kind and loving letter and hoping that you and George are keeping in the best of health, as it leaves me here at present. I'm very pleased Arthur to think I've got a nice son like you to write to me". It goes on to say he's including a Christmas card for them and hopes they stay out of mischief till he gets home again! He did return safely,and his letter is now priceless to me." "Robert came over from Morgan, Indiana and joined the Kings Liverpool Regiment in 1914. He landed in Boulogne in 1915. He transferred through various divisions, ending up in the Durham Light Infantry. "We don't know when Robert returned from France but he met my grandmother, Mary Esther Walker and they married in 1916 in St. Stephen's Church, Elswick. They had 2 children, Esther and Robert and they lived in Ramshaw St in Elswick. "After marrying Robert, Mary was classed as an alien for the rest of the war, and had to visit the police station every month to have her Aliens Order stamped. Robert returned the the USA in January 1920. Mary had intended to join him with the children, but was persuaded by her family to stay. After 7 years of no contact Mary was granted a divorce. "Robert lived the rest of his life in Texas, until he died in 1965 and was buried in the Fort Sam Houston National Cemetery. The picture of his headstone was taken by his great grandson Raymond Spoors last year." "Matthew served in the 9th Northumberland Fusiliers 5th army and took part in the Battle of Vimy Ridge, France. At some point he was transferred to the Kings Own Royal Lancaster Regiment. He was twice wounded, the second time proving fatal after being shot in the chest. He died due to lung damage just weeks before the end of WW1. "He is buried in Valenciennes (ST. Roch) War Cemetery France. His third son and fourth child (my father William Heslop Swinburne) was born three months after his death. His wife Dinah Heslop Swinburne died shortly afterwards and all the children (Matthew, Thomas, Ann and my father) were sent to separate foster families under the care of the army. "I know that Matthew married Betty and had a son David. Thomas married Edna and had a son I think named Michael, and a Daughter Margaret. Ann (Annie) married (Haswell) and had two daughters and a son David. My Dad married Henrietta and my brother Leslie and I were born. It was my brother who researched Matthew, but he passed away before he was able to visit the site. I visited in 2008, 90 years after Matthew's death. RIP." Norman Ernest Innes, of Holly Avenue, Wallsend, born 1896, died 1950, aged 54. Able Seaman, Royal Navy. Michael Innes of Donzdorf, Germany, his grandson, tells the story: "Norman volunteered for naval service on 25th August 1915 and completed his training in 1916 (Able Seaman). "He served on active duty on HMS Nairana (a seaplane carrier) and on HMS Ophelia - M Class Destroyer. Recommendation from the Commanding Officer of HMS Nairana for efforts during operations on Kolvitsa Vollage, Gulf of Kandalaksha, North russian Coast, 2 October 1919. "He met and married Isabel Jones while on shore leave in Portsmouth and they did their courting on Calrence Pier in Southsea and married before he was demobbed in 1923 and they moved to Wallsend. Norman died of Parkinsons disease at the early age of 54." 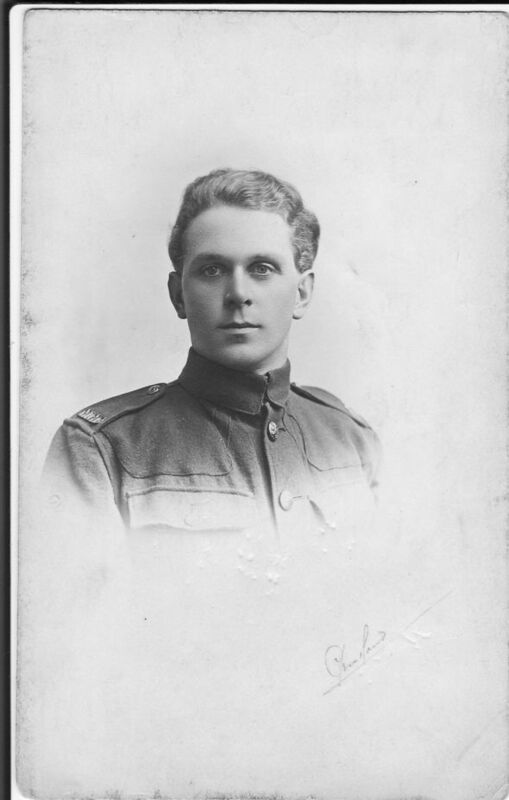 John Robert Stappard, of Stoddart Street, Shieldfield , Newcastle , born 1892, died 1917, aged 25. Private , 9th Battalion Highland Light Infantry. Doreen McNally of Newcastle, his brother's grandaughter, said: "John Stappard enlisted in his home town of Newcastle but instead of being placed in a local regiment he was sent to the 9th Battalion Highland Light Infantry, in Glasgow. "On the 25th and 26 th September 1917, John took part in the Battle of Polygon Wood which is 4 miles east of Ypres , Belgium. The battalion was being shelled not only by the enemy on the ground but also by low flying enemy aircraft.During those two days several officers were killed or injured and 450 ordinary soldiers were never seen again. John was reported killed on the 26th September 1917. "His body was never found. His name appears on the Memorial Wall to the Missing at Tyne Cot Cemetery , Belgium, as well as on a war memorial in the former St Jude's Church, Shieldfield, Newcastle." "Enlisted 10th dec 1915 in the DLI machine gun corp seen action with the Durham LI RoyalScot,s/Royal Scot's Fusiliers/the Highland Light Infantry. He served with army in Germany Demobilised 21th mar 1920/He was wounded, had the same uniform on for 6months returned to UK to work in coal mines." Henry Ridley, of Blaydon, died 1917. Army private 16th bn Northumberland fusiliers number 1186. James Ridley Parker of Gateshead, the grandson of Henry's sister, said: "Henry Ridley brother of Mary parker and husband of Margaret Jane Ridley. private 16th bn northumberland fusiliers died of wounds 11th july 1917. Buried Coxyde Military cemetery West Viaandereb Belgium." "My grandfather was killed in France in 1918 leaving behind his parents, sister Elizabeth and brother Bert. He was married to Edith Wood and they had a son, my father, William Wood. "After my grandfather was killed Edith remarried and became Edith Sewell, when my father reached manhood he married Barbara Brown who gave birth to my brother William Wood and myself Doreen, my brother passed away aged 59 but had tried in vain to find out details about our grandfather and where exactly he was killed. "He lived at 67 Beresford road, his medals were delivered there on 6 August 1921, unfortunately we have no photographs of him but would to know what he looked like."